A genetically engineered ferret could help reveal how humans got their big brains. By inactivating a gene linked to abnormally small brain size in humans, researchers have created the first ferret with a neurological mutation. Although the original impetus of the work was to study human brain disease and development, says Howard Hughes Medical Institute (HHMI) Investigator Christopher Walsh, the results also shed light on how the human brain expanded during the course of evolution. "I'm trained as a neurologist, and study kids with developmental brain diseases," says Walsh, of Boston Children's Hospital. "I never thought I'd be peering into the evolutionary history of humankind." He and colleagues, along with Byoung-Il Bae's lab at Yale University, report the work April 11, 2018, in the journal Nature. Usually, the outer layer of the human brain, called the cerebral cortex, is large and highly folded. But things can go wrong when the embryonic brain is being built, resulting in a much smaller cortex. This occurs in microcephaly, a condition where babies have significantly smaller heads and brains than normal. Microcephaly can have a genetic root, and has also been linked to recent outbreaks of the Zika virus. Researchers have identified genes that play a role in the condition, some of which are essential for cerebral cortex growth during embryonic development. Mutations in a gene called ASPM, for example, reduce the size of a human brain by up to 50 percent, making it about the same size as a chimpanzee's brain. Scientists have studied microcephaly in mice to better understand the condition in humans, but learning about human disorders from mice can be tricky. A mouse brain is a thousand times smaller than a human brain, and lacks several kinds of brain cells that are abundant in humans. 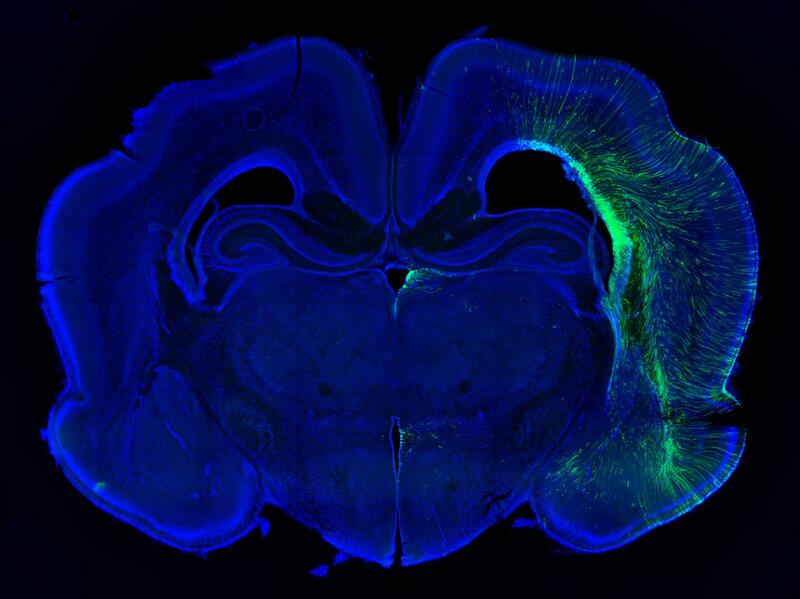 Inactivating Aspm in mice shrinks their brains by only about 10 percent. It's such a subtle defect that these animals, called Aspm knockout mice, provide limited insight into human cortical development, says Walsh, who leads the Allen Discovery Center at Boston Children's Hospital and Harvard Medical School. This prompted Bae and Walsh's team to genetically inactivate, or "knock out," Aspm in a mammal with a larger, more convoluted cortex, more like that of humans. Ferrets fit that bill because they are a large-brained mammal that breeds quickly and easily, Walsh says. "On the face of it, ferrets may seem a funny choice, but they have been an important model for brain development for thirty years." Still, scientists haven't done much research on ferret genetics. The whole idea of an Aspm knockout ferret was considered new – and a little risky. In 2013 Walsh pitched his project to HHMI and got the budget boost he needed to make it happen. His team's Aspm knockout ferret is only the second knockout ferret ever created. One of the study's coauthors, John Engelhardt of the University of Iowa, made the first nearly 10 years ago to study cystic fibrosis. Walsh, Bae, and their colleagues discovered that their ferrets model human microcephaly much more accurately than do mice. The ferrets displayed severely shrunken brains, with up to 40 percent reduced brain weight. And, as in humans with the condition, cortical thickness and cell organization were preserved. What's more, the ferrets reveal a possible mechanism for how human brains have grown over evolutionary time. Over the last seven million years, human brain size has tripled. Most of this expansion has occurred within the cerebral cortex. Indeed, in the mutant ferrets, researchers traced the cerebral cortex deficits to a type of stem cell called outer radial glial cells (ORGs). ORGs are created by stem cells capable of making all sorts of different cells in the cortex. Walsh's team found that Aspm regulates the timing of the transition between these stem cells and ORGs. This affects the ratio of ORGs to other types of cells. Thus, tweaking Aspm can actually dial up or down the number of nerve cells in the brain, Walsh says, without having to change many genes all at once. That's a clue that the gene could have played a role in the evolution of the human brain. "Nature had to solve the problem of changing the size of the human brain without having to reengineer the whole thing," Bae says. Aspm codes for a protein that is part of a cellular complex called the centriole. Walsh and colleagues found that knocking out this gene disturbs the centriole's organization and function, suggesting an underlying biochemical mechanism for the brain deficits seen in the ferrets. In humans, a few genes associated with centriole proteins, including ASPM, have undergone recent evolutionary changes. These genes might even be important for distinguishing humans from Neanderthals and our closest living relatives, chimpanzees, Walsh says. Overall, he says, the study demonstrates the advantages of using ferrets to study some human neurological disorders. It also points to new mechanisms at work in the brain development of individuals and in species like humans over evolutionary time. "It makes sense in retrospect," Walsh says. "The genes that put our brains together during development must have been the genes that evolution tweaked to make our brains bigger." Matthew B. Johnson et al., "Aspm knockout ferret reveals an evolutionary mechanism governing cerebral cortical size." Nature. Published online April 11, 2018.